You should become familiar with the available options for not only screen images in Photoshop Elements 11, but also sharing — particularly online sharing services. You also need to know the acceptable standards for online hosts, where you eventually send your creations, and for the devices people are likely to use to view your creations. What device(s) are going to display your creations? For viewing photos and movies, the device options include computers (including desktops, notebooks, and netbooks), handheld devices such as mobile phones, tablets such as the Apple iPad and Samsung Galaxy Tab, and TVs. If you want to make your creations accessible on all devices, the tools you use within Elements and the file format you export your files to are different from the tools used and file formats you might use for showing creations on a TV or on a computer exclusively. Adobe Flash: Some hosts convert your video uploads to Adobe Flash. If you want to share photos with iPhone/iPod/iPad users (more than one billion and counting), you need to stay away from any host that supports Flash-only conversions. However, you should check sites regularly. Many sites are transcoding video so that people can view content on the widest range of devices that include iPad and iOS as well as Android systems. Storage space: Hosts vary greatly in terms of the amount of space allocated for storing content. If you have large video files you want to share, you need to be certain the storage host you choose allocates enough storage space to permit you to upload your files. What storage hosts are the most popular? From within Photoshop Elements, you can export directly to Vimeo video sharing for computers, iOS, and Android devices; Adobe Photoshop Showcase; SmugMug Gallery; Facebook; and Flickr. Some of these providers may be new to you. Just be aware that they all perform a similar kind of service where photos are uploaded and people you invite to see your creations can access them. Facebook: Facebook is an online service that’s clearly among the most popular worldwide for sharing photos. If Facebook were a country and its users were all citizens, it would be the third largest country in the world behind China and India. Facebook offers you up to 200 photos maximum per album, up to 1,024MB for each video, and unlimited space for total albums and videos. When you submit videos to Facebook, the videos are transcoded to Adobe Flash for viewing on computers but also contain coding for viewing on iPhone/iPod/iPad. The process is transparent to the user. You just upload a video in any one of more than a dozen different formats, and anyone with any device can view the video. Facebook is clearly the leader for hosting all your creations. *Flickr: Whereas Facebook provides you with near limitless opportunity, Flickr (operated by Yahoo!) is much more restrictive. Flickr assesses maximum storage per user according to bandwidth. You can upload only so many times, and then you have to wait until the next month to upload additional photos. It’s much more limiting than other services, and video files are restricted to small file sizes. You can upgrade to a premium account for a fee, but why bother when you can get it all free with a much better user interface on Facebook? MySpace: MySpace (a division of News Corporation) is moving to more support for iPhone/iPad users. A custom application is available from Apple iTunes, and MySpace is translating all its Flash video to HTML5 that can be viewed on iPhone/iPad. Adobe Photoshop Showcase: Perhaps one of the easiest methods for sharing your photos and videos, Photoshop Showcase is easier than ever to upload and view your creations. The service offers you a maximum of 2G of storage space. You can acquire additional space for a membership fee. Vimeo. The name comes from video by replacing a d with an m. Vimeo currently has over 65 million unique users per month and is rapidly becoming a social media site for video that is supported on computers, Apple iOS, and Android devices. You can tap into other sources that aren’t direct links from within Photoshop Elements. Some of the more popular ones include Photobucket, Friendster, Picasa, Fotolog, and more. If you search the Internet, you can find a vast number of free hosting services. What types of creations can you share? Obviously, you can upload individual photos to any one of the online services. In Elements, you can click the More Options button on the Share panel and choose from one of the listed services. Slide shows: In Windows, you can create a slide show and choose to export the slide show as a movie file (.wmv) or a PDF. On the Macintosh, you’re limited to PDF only. If you work on Windows, export to .wmv and upload your file to an online host. 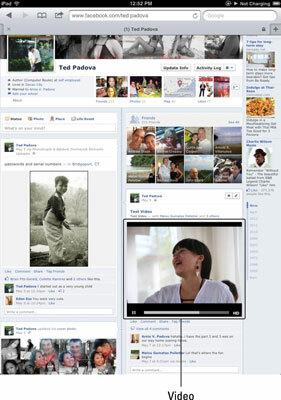 If you use Facebook, users of all devices can see your creations on any device. Slide shows have an additional benefit in supporting audio files. You can add audio to the creations, and the audio plays on all devices when uploaded to Facebook. If you try to upload the same file to Flickr, more often than not the file size will be too large to host. Web hosting: If you want to host videos on your own website and make the videos accessible to iPhone/iPod/iPad users as well as computer users, you need a little help from Adobe Premiere Elements. In Premiere Elements, you can export video for Mobile Devices and the resultant file can be viewed on iPhone/iPod/iPad as well as computers. Also, Premiere Elements supports Mac-based services that aren’t available in Photoshop Elements, such as slide shows exported as movie files.